Brisbane Duo 611 are two Brisbane based performers producing their own brand of rock cover versions. They bring to life the best of the best classic, alternative and pop rock anthems. 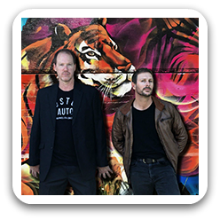 While performing live Brisbane Duo 611 will reach back as far as the 70’s to bring you an authentic rock music experience. This is a duo that deliver the full rock band sound. Brisbane Duo 611 have the ability to adjust their sound to meet db restrictions, allowing the two piece act to tailor their sound to any event. Brisbane Duo 611 are a duo born from a love of popular rock music genres, brought to life through a passion for playing live. With an extensive catalogue of popular music, Brisbane Duo 611 will deliver a sound experience you will not forget. These guys played my 40th and were amazing!!…. all my guests wanted to know where I found them!… great 90s rock covers from when music was cool, very friendly and accommodating fellas. As an honest music loving Kiwi boy I can’t recommend these guys enough!…. If you want a good vibe these guys are the one.